Probably the most luxurious and stylish diffusers anywhere in the world come from Agraria of San Francisco. Their beautiful products have that touch of hand-crafted elegance that sets them apart and the use of only the finest ingredients in their essential oils means that the fragrance of Agraria AirEssence and PetiteEssence Reed Diffusers lasts much longer than any other brand. Read on to find out why these diffusers are so popular both for giving and for keeping, where you can get yours online at a great price and how to get your hands on a set of four of these delicious fragrances for a fraction of the cost of the same items bought individually! Agraria’s history of providing wonderful fragrances dates back to the 1970s when Henri Bendel’s director, a lady named Geraldine Stutz invited Stanford Stevenson and Maurice Gibson who were the founders of Agraria, to showcase their fragrances at Bendel’s shop called “Scentiments”. She made this decision after being given a box of pot pourri in the bitter orange fragrance – the rest, as they say, is history with what the New York Times described as a ‘woodsy blend’ being bought to grace the living rooms of Park Avenue! Agraria is now both the largest and the oldest of America’s luxury home fragrance companies and their products can be found in the finest hotels and bought in the best shops all over the world. However, you do not have to travel far to get yours! Just a click of the mouse will take you to Amazon where these wonderful fragrances are on sale at great prices ! Each of the Agraria AirEssence ™ and PetiteEssence Reed Diffusers are presented in a beautiful Italian perfume bottle which has become the signature of the brand. Each bottle has a glass stopper and comes complete with a beautiful mirrored tray which is hand-made and antiqued to provide a practical protector for precious surfaces the diffuser might stand on but is also a thing of beauty in its own right. The AirEssence range are the larger diffusers and the PetiteEssence are smaller diffusers designed specifically for smaller areas and for giving. The fragrance is absorbed by the reeds placed in the bottle. You can turn up the fragrance volume by increasing the frequency with which you turn the reeds. Although these diffusers from Agraria cost more initially, they last so much longer than many other brands making this luxurious product comparable in price with many other brands over the long-term. Agraria use only essential oils of the very finest quality – and absolutely no alcohol so the fragrance lasts for up to a year – however many happy customers – like this lady whose review I have printed below, have found them to last much, much longer! The larger, Agraria AirEssence diffusers are recognised as having the longest lasting fragrance of any reed diffuser available. Top Tip: Want to sample a range of Agraria fragrances and save money? Why not choose an Agraria PetiteEssence Collection? In each beautifully packaged gift set, you get four of the PetiteEssence bottles as above, each one supplied with its own tray and set of reeds. Agraria Nob Hill PetiteEssence Collection – The fragrances included are Bitter Orange, Lemon Verbena, Lavender & Rosemary and Balsam. 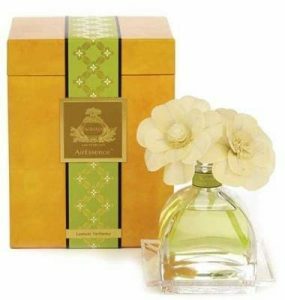 Agraria Santa Barbara PetiteEssence Collection – The fragrances included are Mediterranean Jasmine, Lime & Orange Blossoms, Golden Pomegranate and Cedar Rose.